One thing we frequently saw while traveling almost entirely back roads from Pittsburgh to Washington D.C., then to Richmond and back: There are so many small family stores, restaurants, and attractions in our country that are struggling, dying, or already gone! Some of these places have supported multiple generations of families, helping them to grow, thrive, and build up the communities around them… and they’ve been lost to the meat grinder of more, bigger, and faster. While in Richmond, I was trying to explain to my parents why I so dramatically preferred taking back roads. At the time, I was struggling to put it into words. As we were riding home, I came to realize why I preferred it so much (aside from the scenery & minimal traffic) – we have the opportunity to truly experience America. Go ahead and make fun if you like, but it’s really true. What you are seeing is not the cookie cutter McDonalds version of America that you experience when driving 75mph down the interstate. What you see is the real America – at least, a slice of it – while cruising at 40-60mph along back roads, byways and the original interstate system – Routes 30, 40, 50, 250, 66 etc etc. People own property, live and work along these roads. Instead of skipping around the outskirts of town, these roads cut right through the heart of them. You get a feel for the place. 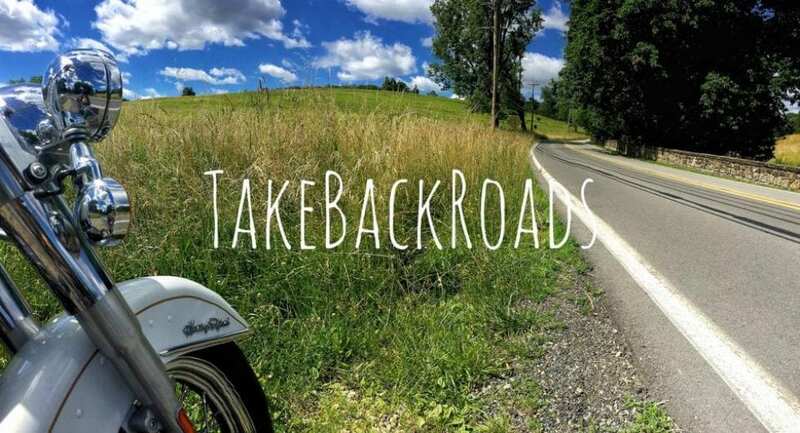 Back roads play host to a lot of the cheesy Americana stuff you might have experienced while travelling in the 50’s, 60’s, and 70’s. You get to see and experience things, and meet people, that you otherwise never would. This all spawned an idea. I was reflecting on the whole experience, talking with Amanda about it while we rode home. Travelling on the back roads has dramatically altered my thought process on how I travel – and how I live my daily life. While I used to look at the trip to and from my destination as a dreary hurdle to slog through during vacation, as something that I wanted to be over as quickly as possible… the journey itself is now as much a part of the entire experience as the vacation I’m heading to. This train of thought ended up with the idea to start a blog. A place for people to share experiences, pictures, suggestions, and thoughts. A place for us to encourage each other to get off the highway and explore the byways and back roads. I feel like many Americans just aren’t doing this anymore when they travel – the journey is no longer a part of the vacation. It’s a wasted day both ends of your trip: “let’s just get there (and home) as quickly as possible, cramming some in cheap fast food, maybe sleeping at some boring chain hotel and getting back on the road” … instead of exploring roadside stops and local family restaurants and businesses along the way. Unfortunately, this altered mindset is also visible in the towns and places you pass through: you see a number of restaurants and businesses that are closed down, boarded up, or are for sale. Family-run operations are going out of business because people just aren’t passing through often enough for them to make a living. This is a big goal that I have in mind – a way to get the word out to see what we can do to support smaller, more local businesses instead of these massive chains that are killing off American originality. Don’t get me wrong – I occasionally eat or shop at chain places myself. This is not simply some anti-corporation crusade – large businesses support millions of American families. This is about bringing attention back to the individuals and families that are pouring their hearts and minds into bringing something unique to life in their community and our country. In addition, this is not a bikers-only kind of blog – this site is for EVERYONE. I want to spread the word about the amazing experiences I am having seeing our country for what it truly is in hopes that A) you get out there and check it out yourself, and B) we can all find more amazing places to go see and experience! And, of course, to help keep the places that make America TRULY great up and running. Happy travelling!